There was a post on UKS about the Dymo label maker. I’ve also played with the Motex one – and I like the fonts on that one a lot more than the standard Dymo one. 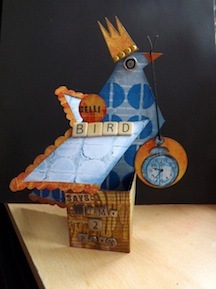 But I only recently got a couple of rolls of washi tape – bought on a whim, really. 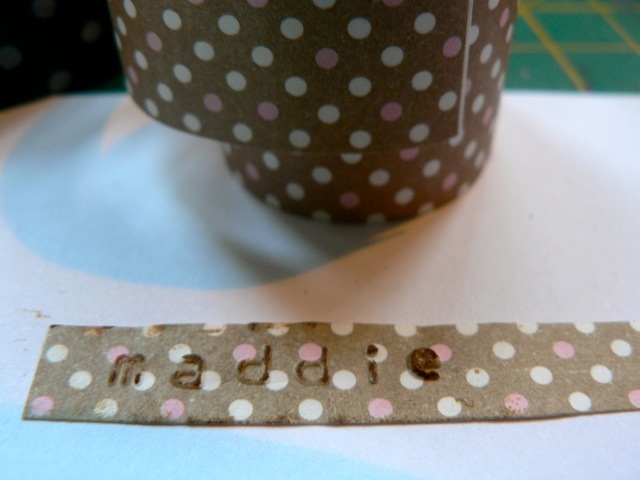 And while playing with the Dymo and Motex for a reply on UKS, I had the idea to use the washi tape to alter the label tape. It works pretty well in either! Let me preface the photos by saying that I don’t have the best washi tape for the job. 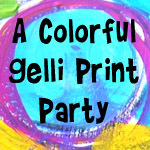 The dotty pattern makes reading the text tricky, but solid colours will work better. Also, you can use cardstock rather than the label tape, true, but the washi tape has a nice sheen to it and, of course, the label tape is already sticky. 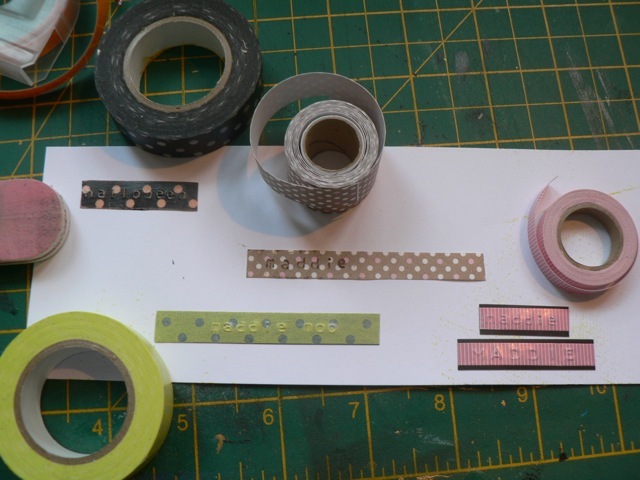 If, like me, you have some unappealing colours, or slickery looking tape (and I always prefer the matte version but somehow DO have shiny ones in my stash) this lets you make use of them. 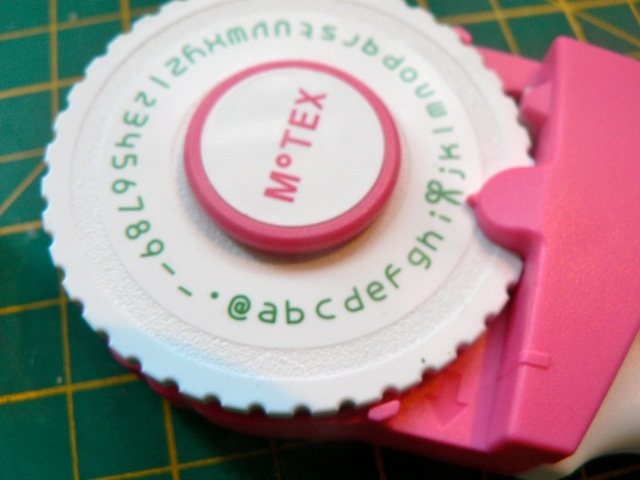 Let me start by showing you the cute lower case font on this Motex wheel. The upper case font is cute too. See at the upper right? That little groove is where you insert the end of the tape, there is no compartment for it. 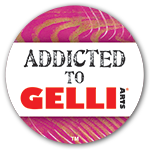 All you do is stick the washi tape to the top of the label tape and trim. It did work, kinda, wrapping the tap to the back, but then it gets in the way of the peel-off strip and sometimes jams. and works in the Dymo as well, just in case you doubted me! 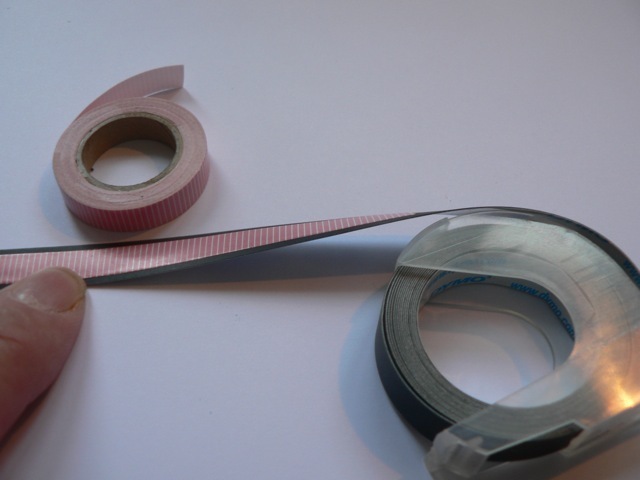 and the wider paper rolls can be cut to size as well – also sticky on the back and with more weight so no need to stick them to the label tape. Because (again with the dots!) the tape keeps the Motex/Dymo from doing what it is meant to do ( ie create the white-on-colour text by the pressure of the embossing cracking the surface of the tape) I pressed the taps lightly onto Vintage Photo to make the text stand out a bit more. 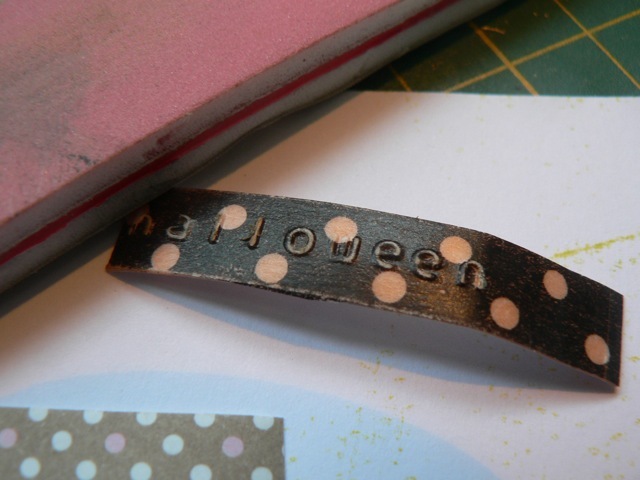 On this one, I lightly sanded away the washi tape to reveal more of the letters. That was black dotty tape over slick, bright orange Dymo tape. So an overview of al the things I tried. 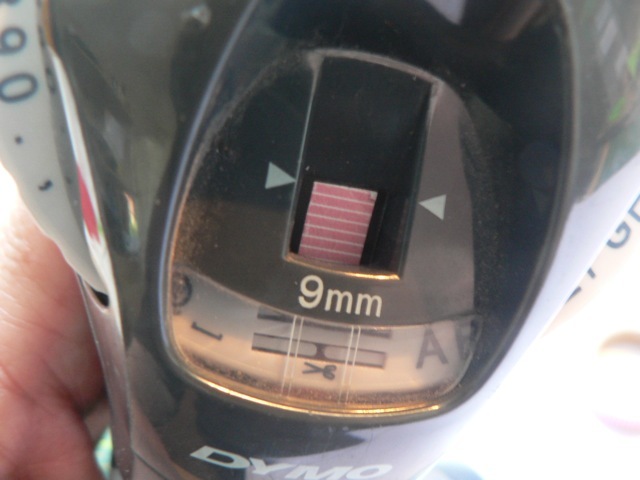 You can see the difference between the Dymo and the Motex fonts on the pink stripey one. 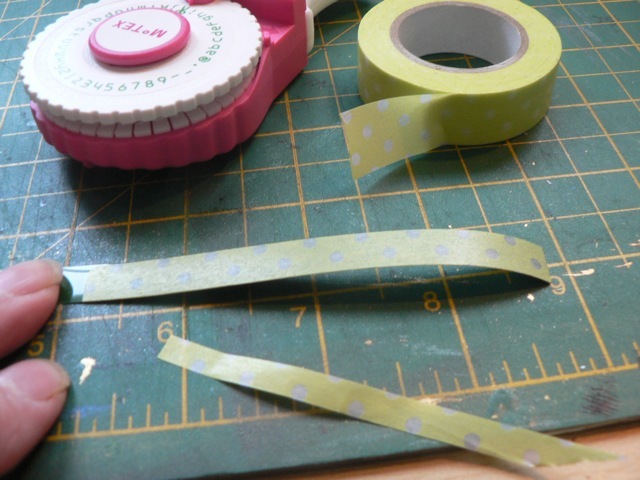 Categories: tips & finds | Tags: how-to, washi tape | Permalink.